Jacob E. Buerk commenced a business in 1861 in Boston selling the "drum" clock made by his brother, Johannes Bürk, in Schwenningen, Württemberg. See I.D. 52. Apparently he saw that the cost of a watchclock could be reduced by eliminating the porcelain face and the intricate, machined recording drum. 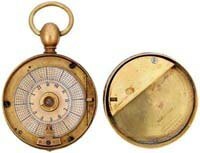 The result was his patent for a portable watchclock using a chart in the shape of a disk. He had his brother produce a clock utilizing these simplifications. Costs were also attacked by use of a pin rather than a full hinge to hold the cover in place, working in conjunction with a lock mechanism diametrically opposite. A fair proportion of all these pinned covers have been lost, and with them the inscribed Buerk name, but the fact that the cover was of this type serves to identify the clock as a J. E. Buerk. Jacob's U.S. Patent of January 1, 1865 doesn't claim anything about the marking mechanism, but it pictures a system using the same sort of marking springs used in his brother's clock. It is unknown if any clocks were produced on that design. From evidence in a flyer of 1867, Jacob's clocks by that date or earlier were employing "tumblers" to prick the dial when one is depressed by a particular station key. In the accompanying picture of clock No. 17527, there are six tumblers, each of which will puncture the chart at a different radius when acted upon by the corresponding key out of a set of six different keys. There is no evidence that Mr. Buerk ever marketed a clock with more than six tumblers, though the industry later moved on to clocks with 30 tumblers. After a falling out with his brother's firm, Jacob imported clocks made to his model but produced by one or more other firms. The principal supplier identified with some assurance is Theodor Hahn of Stuttgart (Clock No. 10,086). Still later, Jacob reverted to importing from the Bürk firm clocks which, though they may have been modeled after Jacob's design, had become a widely offered standard product (with a hinged cover) known as the "Amerikaner." This name is well known from brochures and advertising leaflets, but the only clock known to be so marked is owned by Werner Schmid in Stuttgart. 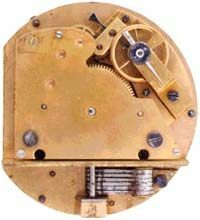 By the end of the century, T. Hahn, A. Meyer, J. Schlenker-Grusen, and J. Bürk were all offering clocks in which it is difficult to find a characteristic not found first in J. E. Buerk's clocks. The major exceptions would be the almost universal addition of a detector mechanism by the others and Hahn's beginning to use an embossing registration system in place of pinprick holes in the chart. See I.D. 101.